Two piece Conti suit 06120/221867 B/Green Acid REP P/Visc 65/35 Easy fitting long sleeve jacket with zipper * Breast pockets with flaps and stud closure * 2 Skirt pockets *Trouser with 2 side pockets * Hip and rule Pockets * Zip fly.This is an acid repellant Conti suit made of two separate parts, the pants / trousers and the jacket, a two-piece style. This means it will cover your body from the neck down to your ankles and wrists. 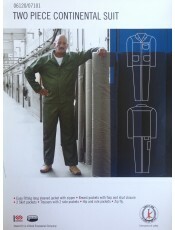 You can remove the top if needed to cool off or wh..
Artisan's work suit 02100/221867 B/Green one piece. 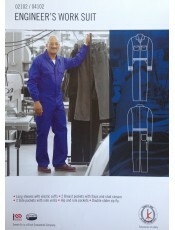 Long sleeve with hemmed cuffs * 2 Breast pockets with flaps and stud closure * 2 Side pockets with side vents * Hip and rule pockets * Button fly.Boiler suit / jump suit.This is an acid repellant overall in a one piece boiler suit style. This means it will cover your body from the neck down to your ankles and wrists. Should it get acid onto it , it will repel the acid and it will take much longer than regular materials to get holes while res.. Engineer's work suit 02102/221867 B/Green one piece Long sleeve with elastic cuffs * 2 Breast pockets with flaps and stud closure * 2 Side pockets with side vents * Hip and rule pockets * Double slider zip fly.Boiler suit / jump suit ..
FLAME RETARDANT & ACID RESISTANT CONTI JACKETSABS APPROVEDD59 flame retardant and acid resistant SABS approved fabric ∙ Industrial quality flame retardant 50mm silverreflective tape (EN 20471 Class II ) ∙ Concealed studs to close collar in cold weather ∙ Left chest pocket with stud flapConcealed YKK brass zip front ∙ Lower patch pockets ∙ Elasticated cuffs ∙ Side seam slits for ease of movementAll seams triple needle stitched ∙ Pockets attached with double needle ∙ Stress points bar-tackedFA..
FLAME RETARDANT & ACID RESISTANT CONTI TROUSERSSABS APPROVEDOur Flame Retardant garments offer certified protection where there is a risk of contact with heat and flame. 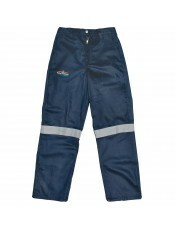 ISO EN 11611 / 11612 / SANS 1423-1Our Acid Resistant garments offer certified protection against penetration, absorption and repellency to low volatility liquid chemicals in accordance with ISO EN 6530Our Acid Resistant garments offer certified protection against penetration, absorption and repellency to low volatility liqui.. 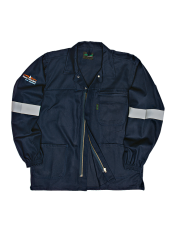 Jacket only Conti suit 06401/221867 B/Green Easy fitting long sleeve jacket with zipper * Breast pockets with flaps and stud closure * 2 Skirt pockets. 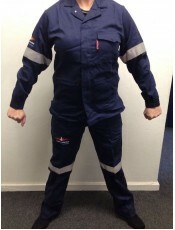 ..
Sasol Spec Two piece Conti suit 07141/215056 D59 100% Cotton zero flame retardant / acid resistant colour navy blue flame 07141 Easy fitting long sleeve jacket with zipper * Breast pockets with flaps and stud closure * 2 Skirt pockets *Trouser with 2 side pockets * Hip and rule Pockets * Zip fly.50mm silver flame retardant tape on biceps and thighs.This overall / Conti suit is made specifically to satisfy the needs of the Sasol company. 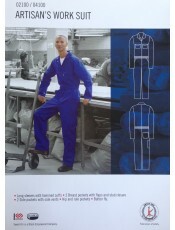 As with all our overalls / Conti suits, it is made..
Trouser only Conti suit 06305/221867 B/Green Trouser with 2 side pockets * Hip and rule Pockets * Zip fly. ..